Cancellation must be notified directly to the accommodation provider at least 24 hours prior to arrival. In the event of a no show, your card will be charged for the first nights accomodation total. If for any reason you will not arrive by the check-in time indicated by the property you should call to advise the delay. Please, consider the Guesthouse/Hostel is located in a quiet residential house in the downtown, and a noisy party is not desirable here during your stay. 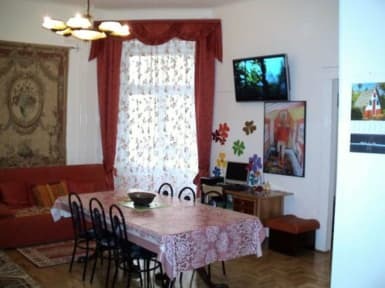 The welcoming and comfortable Garibaldi 5 Apartments & Rooms is recommended by Let's Go and Lonely Planet. It is centrally located on the Pest side, between the Chain Bridge and Margaret Bridge, a block from the Danube River and Parliament. We offer in a quiet last-century classic architecture building spacious private rooms from double to a 4-5-6 bed Family style with private bathrooms, and one- and two-room apartments. Some student-like attic rooms with shared bathroom are available too. A new Hostel session (called Parliament) offers rooms with shared bathroom and private rooms en-suite.